Here's a system of budgeting that is easy to implement, easy to monitor, will significantly reduce staff time spent on budgeting, and will ensure true fiscal accountability. Written in a nontechnical, understandable, how-to language and format, this handy guide includes dozens of relevant forms and documents. EDWARD J. McMILLAN, CPA, CAE, is the author of Guide to Fringe Benefits for Not-for-Profit Organizations, Complying with SFAS #116 and #117, Essential Financial Considerations for Not-for-Profit Organizations, Second Edition, Budgeting and Financial Management Handbook, Second Edition, Model Accounting and Financial Policies and Procedures Handbook, Second Edition, and The Audit: A Novel. He is a nationally recognized speaker on not-for-profit financial and management topics and, in 1993, was appointed faculty chair for finance for the United States Chamber of Commerce’s Institutes for Organization Management program. Chapter 1. Basics Accounting and Financial Operations. Chapter 2. Effective Use of Footnotes and Financial Ratio Calculations for the Statement of Financial Position. Chapter 3. Controllable and Uncontrollable Expenses. Chapter 4. Controllable, Semi-Controllable, and Fixed Expenses. Chapter 6. Natural and Functional Statements of Activity. Chapter 7. Internal Financial Statements. Chapter 9. Continuous Budgeting System Overview. Chapter 10. The Executive and the Budget Process. Chapter 11. Expense Reduction Plans. Chapter 12. The Monthly Budget Process. Chapter 13. The Cash Flow Budget. Chapter 14. Getting the Budget Approved. Chapter 15. Suggested Format of Budget Documents for an Approving Body. Chapter 16. The Role of the Budget Coordinator. Chapter 17. Accounting and Budgeting for Fringe Benefits. Chapter 18. The Capital Budget and Depreciation. Chapter 19. Inventory Purchases and Calculation of Cost of Goods Sold. Chapter 20. Accounting and Budgeting for Dues. Chapter 21. Capital Assets: Lease-or-Buy Decisions. Chapter 22. The Long-Range Plan. Chapter 25. Putting It Al Togeher. 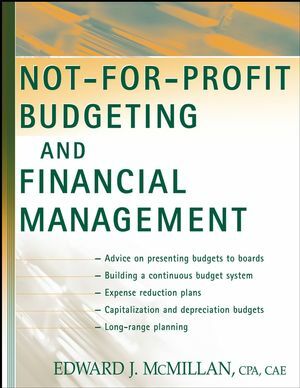 This completely revised and expanded edition also includes all-new material on long-term financial planning, so that not-for-profits can work toward liberating themselves from the year-to-year scramble for increasingly scarce resources. Includes three all new chapters. Contains dozens of sample forms, letters, and statements. Inlcudes a glossary of relevant terms and a full index.